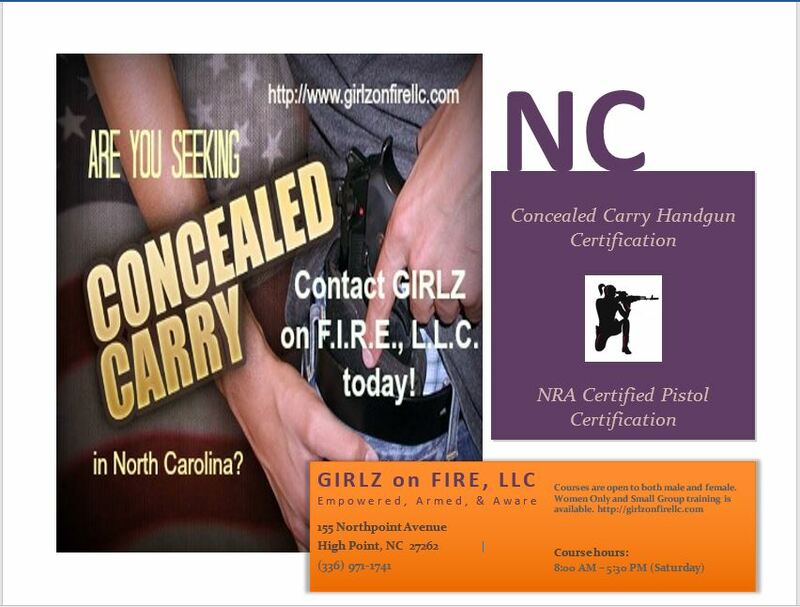 Legal Concealed Carry in North Carolina - NC F.I.R.E. In the State of North Carolina, citizens wanting to obtain a NC Concealed Carry Handgun Permit are first required to complete an eight-hour concealed carry certification course. After successfully completing an approved handgun safety course, you must submit an application for a state-issued permit in the county in which you reside. At the local Sheriff’s office, you must submit your original handgun course certificate along with the application, pay a non-refundable fee of $80.0 and provide two sets of fingerprints, which typically cost $10.00. In addition, you must authorize a mental health check. Once you receive your NC Concealed Carry Handgun permit you are required to renew it every five years. You will be required to submit a renewal application with the sheriff’s office in the county in which you reside at least thirty days prior to your permit’s expiration date. You must also submit a notarized affidavit stating that you remain qualified to receive a permit. The fee to renew a permit is $75.00. The sheriff’s office will perform another check into your criminal history and make another query into the NICS database. Dependent upon the local regulations in your county, you may be required to take another handgun safety course prior to renewal. As a current permit holder, you will receive a notice at least forty-five days in advance of your concealed carry permit expiring. You may apply to renew your concealed carry permit within ninety-day of it expiring. If you fail to register to renew your permit prior to the expiration date, the requirement to take another handgun safety course may be waived if you submit your renewal application within sixty days of the permit expiring. Deployed military personnel are allowed an additional ninety days after their deployment ends to submit a renewal application. In an emergency situation, a temporary permit may be issued to an individual if the sheriff has reason to belief that the individual’s safety, property, or the safety of the individual’s family is in immediate danger. You must first establish with the sheriff’s office that an emergency exists, submit two sets of fingerprints, and pay a non-refundable fee of $80.00. The temporary permit will be valid for a maximum of forty-five days and may be revoked by the sheriff at any time.